Japanese pop sensation Hatsune Miku is the young, future sounding and vibrant operatic lead of The End. She will perform live and clad in custom Louis Vuitton gear. One thing Hatsune is not, is human. 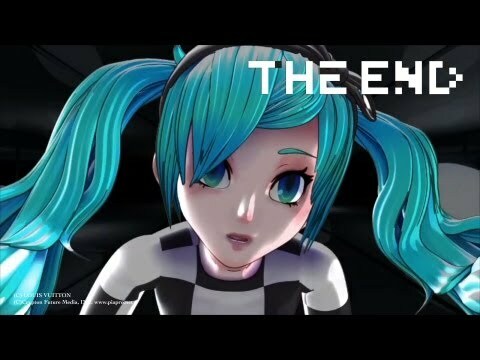 Hatsune is a Vocaloid projection with a computer-generated voice and is topping the charts in Japan. Sold out concerts prove she’s receiving a lot of love from the crowd who gets to interact with the hologram character. Her debut in the Japanese Opera The End is about death and asks “what is an end?” It is expected to sell out instantly and is also going to play in Paris this November. There appears to be a demand for a play comprised completely of holographic characters and computer generated sound. This rising automaton star is also setting trends in global style as well. Her recognizable teal-pigtailed hairstyle with be accompanied by her signature schoolgirl uniform that will be designed by Marc Jacobs, the creative director for Louis Vuitton. The sketch above is the checkerboard design adapted from the Louis Vuitton spring 2013 collection made for Hatsune. Four looks were tailored for the opera of Vocaloids by Jacobs. There has been some flack in the news about the costume. Some are arguing that it’s commercializing Hatsune and is not an original design for a character who is completely fantastical. We say the geometric shapes of the trendy uniform suit the robo-star and a girl with international fame should wear custom Louis Vuitton.